Almost 19 years ago, we bit something. Well, actually, we ate something “out of this world”. This astonishingly, intrinsically delicious Mediterranean delicacy, called the kebab inspired us to do something big. With just one bite, we immediately fell in love with this incredibly succulent meal. So yummy we can’t think of anything else but kebab! We noticed that kebab was only available at very limited places. So we thought we could spread the joy of this exquisite meal to all Malaysians which led to the development of the most delicious made-to-order kebab that you will ever experience - Kyros Kebab! From a humble beginning, we rose to prominence and quickly became an instant hit in the food business. Customers flocked to our outlets. Enquiries for franchising poured in from everywhere. Now you can find Kyros Kebab in more than 10 outlets in the Klang Valley. 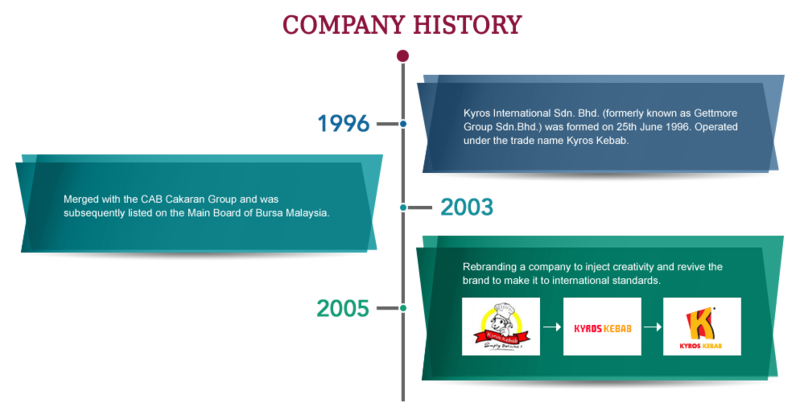 We have gone from strength to strength since we merged with the CAB Cakaran Group which resulted in the subsequent listing on the Main Board of Bursa Malaysia.